Dinlos and Skilldos: Beaten Up! Don Quixote and Sancho Panza get beaten up a lot in this book. I'm starting feel like I may be a bit punch drunk myself with it. I've done the losing your mind section and now I'm into the relentless beatings. It's funny, because that sounds like the plot for the story of many comic book heroes, especially Superheroes. Although, if this were a superhero story there would be a need to indulge a prepubescent wish fulfillment and have Quixote defeat the bad guys, plus Quixote would probably look a bit more like the victim of steroid abuse. Needless to say this isn't that kind of book, even if it does lay down a story format that so many Superhero comics have picked up over the years. It's not fair to compare the two, but interesting none the less. In many ways Cervantes' genius can be seen in the way his view of the hero and the madman was framed in his mind alone and published in 1605 whereas it took the collected minds of many great writers 70 years to come to the same end-story in comics. In other words what Alan Moore did to 60+ years of superheroes, Cervantes did to his hero from page one. 400 years before. Ah, but comics were never meant to be seen as great literature, I hear you say. Neither was Don Quixote. It was a popular entertainment, an amusement. It was read by the everyday Spaniards in streets and villages and read aloud to those who couldn't read. This is not to say that I expect my comic book to turn out something on a par with Kirby, Moore et all (God, I wish! ), no this is just to help communicate the idea of what Don Quixote was in the context of its time, and perhaps help people understand why it is so lauded. 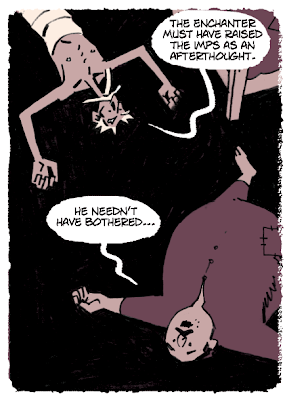 As in the panel above, Quixote and Sancho spend a lot of time on their backs moaning. If there is something to admire about them physically it's their almost 'rope-a-dope Ali' ability to soak up pain. There are a few more beatings in store for our heroes before Cervantes' story spreads into something wider, so I better pick them up so I can knock them down again. I feel their pain. Yeah, most of the tricks supposedly invented by the modernists were usually present in the artform of the novel right from the start.